Finally a disc brake system that is a true bolt-on. 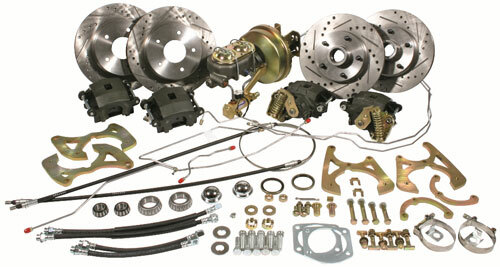 Kit includes minimum offset stock or drop spindle wheel kit, rear brake kit for original rear end 8" booster assembly and pre-bent hard line kit. Stock spindle kit shown; drop spindle kit varies a little. Drop spindles lower the center of gravity while maintaining the full suspension travel. This will drastically improve the ride, braking, steering and handling. Note: 1969-70 models require 1965-68 spindles for stock spindle kit. Specify if using rear end other than stock. 1965-70 drop kits require slight modification to steering arms. Kit includes all brand new components and features Big Bore calipers. Shown with optional upgraded rotors.